The team here has grown a backlog of games needing playing, and with the Nintendo Switch being right around the corner I'll be assuming blog responsibilities for the rest of the week. Expect lots of ramblings and sharing of cookie recipes. We were blindsided last week with our busiest week ever, shattering multiple sales and attendance records including an insanely hype For Honor midnight lock-in tournament. The combination of school being out and warm weather had us scrambling to keep up with demand at the shop. We've met so many new faces recently, some of which have become regulars, but we're also saying goodbye to one of our most regular customers. Kindrid Skylar sets off for boot camp this week - an almost daily customer from the very early days of opening our doors. We're all really sad to see him go and will miss his positive approach to gaming and HYPE energy. This man is going to be very successful in life whatever he chooses to do. Thank you for everyone who attended the sold out VIP party! 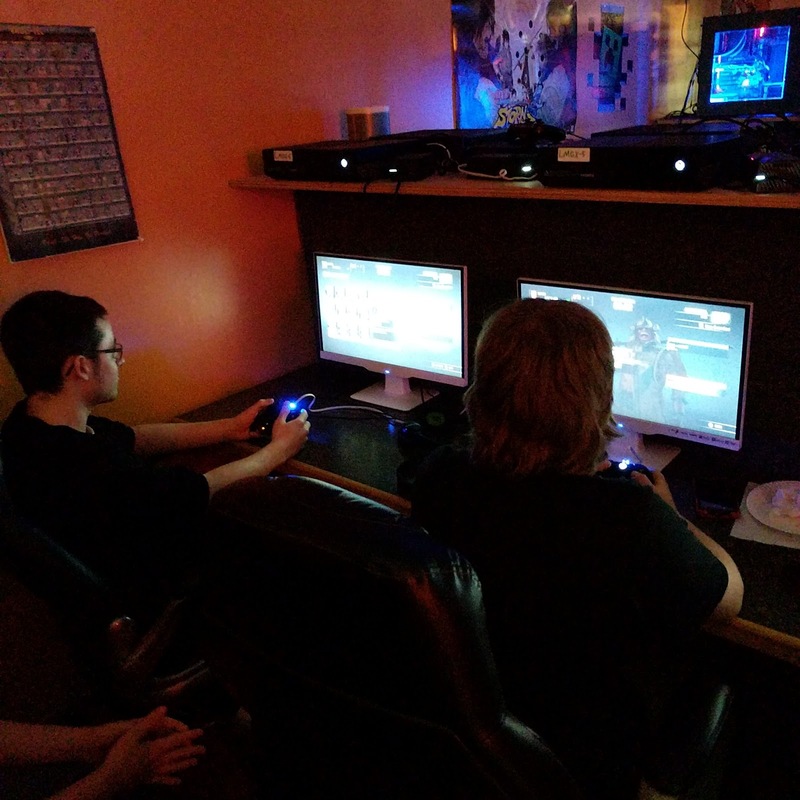 We had a blast gaming and featuring some of the best local pizzas in Rome. Make sure to keep those VIP streaks active to qualify for increasing discounts at the shop! We'll have one in shop with release titles including Zelda: Breath of the Wild, Bomberman, 1-2 Switch and more. We're expecting this will get a lot of use in the early days so availability may be limited. Our friends at ggCircuit are hosting worldwide "WAN" tournaments this March. These are not online tournaments in the traditional sense, but rather "wide area network" tournaments, meaning every team participating is seated at a LAN Center somewhere in the world. We'll be participating in the Hearthstone 1v1 tournament March 18th, and League of Legends 5v5 on March 25th. Details will be out soon! Boy 1: "Nope, I don't want to play anymore." Boy 1: "No! And also I don't want to be your friend anymore." Boy 1: "I don't like you anymore." Boy 2: "This is why you don't have any friends." Kids can be savage. It was painful for me to hear, and painful no doubt for those kids to go through, but also a part of growing up and learning the world. I moved them to opposite consoles to give some separation, and they spent the next few minutes sticking their tongues out at one another until one of the boys ride arrived. The conversation feeds into another ongoing discussion we've been having among LAN Mob staff over where our responsibilities begin and end. While we don't intend to parent and mostly leave our customers to their own machinations, making sure everyone has a good time is important to us, as is seeing our customers grow and improve themselves. My hope is that we can remain a positive place for growth through gaming. I wanted to briefly mention some of the amazing food options just a short walk away in either direction from our shop. Head north on James street and you'll find DeSalvos greens or Luigis pizza, pasta & pastries. Head south and you'll find Maggies breakfast and subs, or Ballister's Bistro's sandwiches, ice cream and cafe. You can dine in or take out - our customers are bringing this food with them to the shop all the time, and it always smells AMAZING. Speaking of amazing things - the team at LAN Mob does an outstanding job day in and day out of maintaining the shop and keeping things running smoothly. There is a lot of behind the scenes maintenance work to keep the machine moving and they continue to show up every day and tackle tasks small and large. I'm very happy to have Sage, Enrique and Rob as part of this company. Tuesday I'll be discussing the social media landscape for Rome, NY businesses. Picture a tumbleweed rolling down a road. Wednesday will feature a guest blog post from Dictator (his third!) regarding the upcoming release of Mass Effect: Andromeda. Thursday I'll have my full review of the NES classic system we've been hogging behind the front desk. Friday we'll have our first impressions of the Nintendo Switch, Nintendo's latest console release.